Fresh cherries blended with sugar, silky, smooth butter, and a splash of brandy — all combined into one sizzling pan. Is your heart beating uncontrollably yet? Thanks to aspiring culinary artist Keri Marino, her homemade Cherry Jubilee recipe is listed below for your convenience. Better yet, this delectable dish only takes less than fifteen minutes to concoct, and Marino’s recipe offers simplicity and promises exquisite flavor. Fortunately, this recipe also requires no level of cooking experience. If you’re an inexperienced chef, you’re in luck! You can still expect riveting results. So what are you waiting for? Combine the ingredients listed below and BAM! Welcome to a world of unforgettable cherries. 1) Wash cherries. Cut each cherry in half and remove the pits. 2) Place the fire on your stove on “High.” Place pan on stove and add one to two tablespoons of regular butter. After the butter slowly starts to melt, add the cherries to the pan. 3) Add half a cup of white sugar to your pan. Proceed to add the other half a cup of brown sugar. Mix with a spatula to blend the two sugars into the cherries. 4) Here comes the excitement: bring the pan close to you and keep it within a diagonal position. Carefully add a splash of brandy, and instantaneously, you will see a flash of fire due to the alcohol. Wait for the alcohol to evaporate, and once it does, the fire will slowly dissipate. Once this is done, move on to Step Five. 5) You are ALMOST done: Turn off the flame on the stove. Next, grab a bowl of your preference and remove the cherries from the pan, placing them in your bowl. 6) Add the vanilla ice-cream. 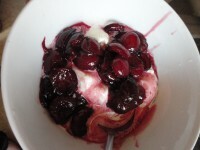 If you prefer to taste more of your cherries, then add less ice-cream. Also, keep in mind that this is your dish. You may choose whichever ice-cream flavor you want. Once you have added the ice-cream, mix thoroughly, and enjoy!